Normally I wouldn’t recommend eating a large amount of sodium in your diet. High sodium levels can lead to high blood pressure, bloating, and water retention. If you are exercising in heat, however, you need to consider fluid replacement and electrolyte replacement. Sodium is the the number one electrolyte you sweat out so it is imperative to replace it. . This is especially important if you are doing multiple bouts of exercise in a day, such as two a day practices, a morning and evening run, or a double yoga! A good refuel while studying dialogue! 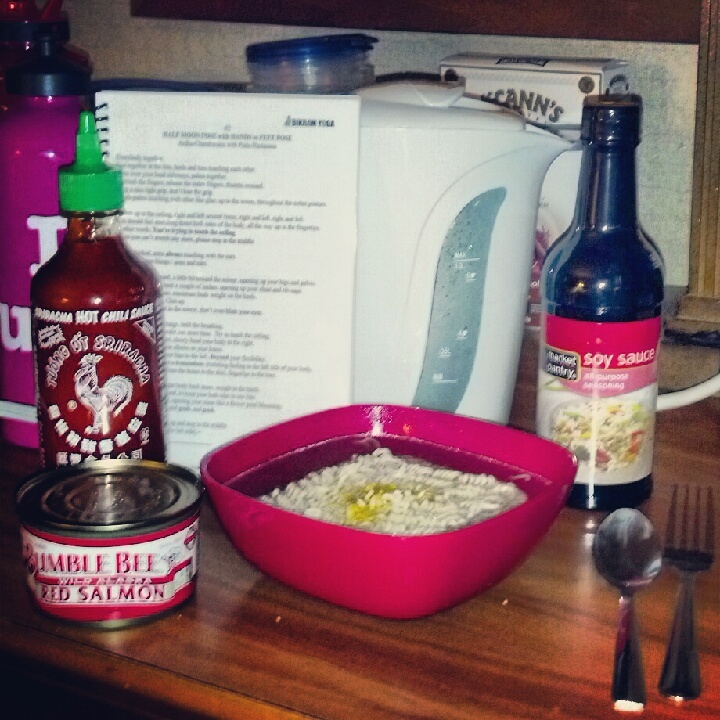 This meal is especially nice because you can make it in your hotel room with just an electric kettle! Add Ramon to a bowl with 1/2 a cup of liquid egg. Pour boiling water over top both as desired. Season with soy and sriacha for more flavor instead of the salt packet that comes with the ramon! Depending on your sodium needs you can also use low sodium soy. By itself this meal has 430 calories, 22g of Protein, 54g Carbs, 14g of fat. If you are eating between workouts, this is a decent mix of Carbs to Protein, but I added a can of Salmon to my lunch to pack in an extra 20g of protein to aid in muscle recovery. Remember, if you are working out hard you have to fuel you body for energy and muscle restoration to keep training at a high level!